The Miller Art Museum and the Donald and Carol Kress Pavilion are working together to present The Water in You, an exhibit that celebrates art and water. The Miller Art Museum is lending the artwork on display to the Kress Pavilion and welcomes this opportunity to share works from its permanent collection in a different space and to expand its audience. “Displaying art in the Kress was always envisioned by the creators of the Kress Pavilion, and many look forward to witnessing the first exhibit,” said Ryan Heise, Egg Harbor village administrator. 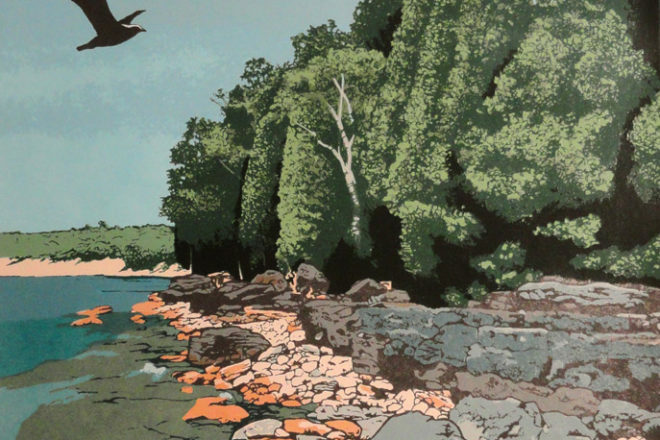 This exhibit is part of the Celebrate Water initiative, an event series that promotes understanding of the threats to Door County’s water and inspires action to protect it. On display from the Miller Art Museum’s permanent collection will be works by Daniel Anderson, James Cagle, Joseph Cook, James Claussen, Wayne Claxton, Malin Ekman, Austin Fraser, Gerhard Miller, Lee Mothes, Ruth Wedgwood Philipon, Suzanne Rose, R. Charles Lyons, Toby Vandenack, Doris White and Rob Williams. The Water in You will be on display at the Kress Pavilion, 7845 Church Street in Egg Harbor, through mid-May. The exhibit is free and open to the public.